Vistaprint – Offering High Quality Mass Customization At Highly Affordable Rates! Founded in 1995 in Paris (France) and headquartered in Venlo (Netherlands), Vistaprint is the prodigy of Robert Keane. 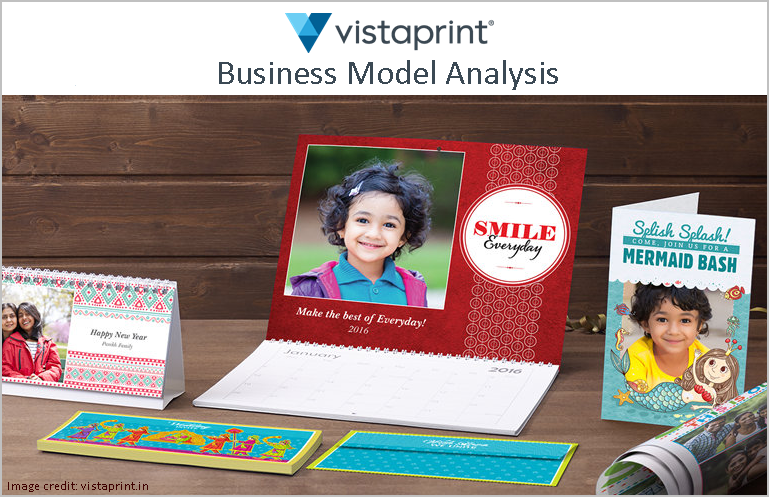 Vistaprint, now a Cimpress company produces marketing materials and promotional items with the help of mass customization and web-to-print systems. With a wide range of quality products that are available at highly affordable prices, along with tools that would help you design and are suited to every skill level and need, it enables millions of business owners worldwide to customise their products and market themselves professionally. What makes them unique is that, they make use of their own patented technology, which helps them to aggregate large numbers of customized orders from each of its brands and print them in automated production facilities in North America and Europe. After re-organization in 2014, it adopted its current name – Cimpress, with intentions to unify their systems across their subsidiary brands. Post that, Cimpress became the parent company of all the subsidiary brands, including Vistaprint as well. How Does Their Process Work? You also get an option to let them specially design the whole card for you. After the order is placed, you will also receive a ‘Vistaprint Order Confirmation’ eMail, containing the details of your order. You can track your order by visiting the Order History page, on “ My Account ”, in the “Account Tools” section. In any case, you can also perform the aforementioned process by just giving them a call on 022-6718 6718, as well. What Kind Of Strategies Have They Adopted? To begin with – this may sound cliché but, it remains a fact that, the best strategy adopted by them still remains their business model as a whole. Vistaprint remains one of the very few companies who actually understand both the ends of a coin – the customer and the business! Vistaprint, during their early days itself had understood that there was a difference between high volume production and low volume production. And with the help of reliable and affordable mass production, one could purchase mass produced products at lower costs. In layman terms – to be able to sustain the business, the leadership, and to give customers what they need (good quality and affordably competitive pricing), the company needed to have a strategy in place wherein, the cost of the whole end-to-end process was minimum and mass-focused. And the only answer was – technology! Using technology, they brought about a lot of changes in that aspect. For instance: rather than paying $80 every time we ship the CD that Microsoft had developed, they developed their own software and distributed across the Internet for free. They also noticed that digital printing was coming into the world, and physical printing was fading out, but here they took the reverse route, and instead they went to traditional large scale printers with large German production presses, and applied digital technology to reduce the set up there as well. Basically, they aggregated the physical and the digital printing, to get a better version of it! This was Vistaprint’s revolutionary (and patent-protected) printing method. They had found a unique way to “gang” print jobs together (meaning: combining similar print jobs in order to print bulk orders of different types of cards in a short time). This is mainly why Vistaprint is able to offer its products at lower prices and, obviously, lower prices = more customers! What Kind Of Partnerships Have They Developed? Although there is no exact figure disclosed by the company, but Vistaprint has partnered with many vendors to produce the products that customers purchase. In general – the target audience of Vistaprint is spread across 120 countries and is divided into two sets. The first major set are the Companies and the Corporates, wherein more than 60% of their revenues come from Small Businesses who have less than 10 employees, while their second set belongs to individual users, homes and families. To summarise their Market Segment – their customers are anyone, be it companies or individuals who wish to attain low volume customized physical products at affordable rates, with good quality. Robert Keane is the Founder, CEO, President and the Chairman of the Management Board of Vistaprint and Cimpress. He currently leads a team of roughly 6000 employees spread across 20 countries. This also includes their management team of – Don Nelson (EVP & COO), Katryn “Trynka” Blake (EVP & President), Ashley Hubka (SVP & CSO), Don Leblanc (SVP & President), Jeremie Profeta (VP & President), Kees Arends (SVP & President), Lawrence Gold (SVP & CLO), and Sean Quinn (SVP & CFO). Robert has completed his Bachelors of Arts in Economics from Harvard University and Masters in Business Administration from INSEAD. Soon after he completed his Bachelors degree, Robert had joined Flex-Key Corporation, which was an OEM manufacturer of keyboards, displays and retail kiosks used for desktop publishing, as an Executive in 1988. This stint continued till 1994, post which he pursued his Masters and one of his classmates there used to work with Microsoft and had left that company. She was very familiar with the Publisher, the desktop publishing software from Microsoft. So he started working for them as a Consultant and researched and advised on the graphic design and printing needs of small businesses in Europe, out of their Paris European headquarters. These combinations of experiences reinforced the idea that there was a desperate need of low volume customized print. By then, he had also managed to make a good fortune as well. Hence, he decided to fill in the gap, and started – Vistaprint! It all began in 1994! Just like most of the graduates from the business school, Robert too was using his observations of the world around him. He wasn’t really interested in trivialities such as sports, music, or high-level US state government oversights. He was looking smaller. At the roots! He got the idea of Vistaprint from a US-based company called PaperDirect, which was a model to use direct marketing for small businesses. He thought of solving the same pain-points in a different and better way. Using Microsoft Publisher! But the world was a strange place in 1995! Half a percent of the world’s population used the Internet, and Direct mail still ruled the marketing world. Hence, Robert decided to play it safe and started out with a mail-order catalogue in 1994 from his Paris apartment. It was called – Bonne Impression! It was basically a direct marketing company for desktop publishing software and supplies. But the odds turned against him and in a short while itself, in November of 1995 – the worst general strike in France since 1969, started. All the catalogues suddenly became worthless, and their company went almost broke. After the tide silenced, they somehow managed to make a comeback in 1996. Indeed, it was a tough time due to the strike along with the lack of financing at first, but then somehow managed to bounce back. They saw a great uptick when they went from zero revenues in 1995 to 2.5 million Euros by 1999. They were a profitable business venture now. Bonne Impression had by now become Vistaprint. By now they had also changed their model of functioning too. They had now shifted to use DTP in a browser, which greatly helped them to avoid paying around 70% of their revenues to Microsoft. Additionally, they had also adopted the combination of Digital Printing, Centralized printing along with Technology to deeply cut down costs and increase their volumes as well. This was followed by their third shift from paper catalogue to an eCommerce model. Basically, they had now taken Vistaprint online. Around the same time, they had also received a second round of funding for 20 Million Francs from a French Venture Capital Fund, which helped them to hire engineers, write the software, and expand to the UK, and then the US as well. They also moved the company to the US keeping in mind the Dotcom boom, to help them raise more funds. But to their luck, four months after they arrived, the dotcom crashed, and financing dreams went out the window! What saved them survive the blow, was their eCommerce model! By 2003, they were making 35 Million in revenues, which further increased to 670 Million by 2010, annually all organically. In September 2005, the company also went and launched their IPO, and began trading on the NASDAQ. They also opened an office a European office in Barcelona and Spain as well. Vistaprint also expanded and retained its subsidiary brands in different locales as well, and in 2014, they also reorganized and unified all their subsidiaries under one parent company called – Cimpress. Since then, they are headquartered in Venlo in Netherlands, employs more than 6000 employees globally, hold over 200 patents worldwide, have been making revenues worth $1.5 Billion, and have acquired 9 companies.